Melissa Gregg & Gregory J. Seigworth, eds. 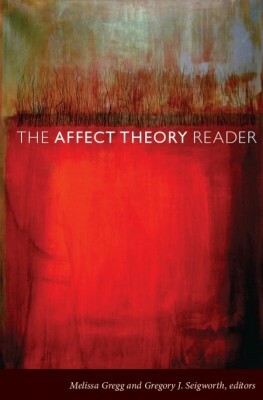 The Affect Theory Reader. Durham, North Carolina: Duke University Press, 2010. 402 pages. Two decades after the affective turn, critical theory’s incorporation of emotion and the body’s materiality has become something of an imperative. Lawrence Grossberg, who is interviewed by Gregg and Seigworth for The Affect Theory Reader, laments how our frequent appeals to affect’s nature as ‘ineffable excess’ have too frequently let us off the hook from close empirical labor (315). The editors have answered his call by theorizing affect in all of its particularity and context. As such, the anthology might best be conceived as taking up a crucial second stage in this turn, organizing itself around a central premise summarized by way of Bruno Latour: “The body becomes less about its nature as bounded substance or eternal essence than the body ‘as an interface that becomes more and more describable when it learns to be affected by many more elements’” (11). The emphasis, then, shifts away from affect’s problematization of discourse—a logical progression succeeding the linguistic turn—toward close readings of the body in its everydayness, in its interfacing with emotions, the sensorium and pre-personal intensities, which, together, constitute a fresh pedagogy of the affective world. This is no small task, but one that the editors accomplish with success and a great deal of passion. Readers can delight in the incisive, richly descriptive, and often humorous prose of its articles. When it comes to articulating the body’s connections to the ineffable profusion of affect, well-crafted prose and novel, insightful perspectives are essential. One such example is Melissa Gregg’s piece on the culture of snark, passive-aggressiveness, and ideological impasse in the office workspace. Her textual analysis of the website Passive-Aggressive Notes and HBO’s Six Feet Under humorously depicts how office politesse streamlines middle class workers into ‘user-friendly’ functionaries, stripping them of their capacities to meaningfully relate. The futility of snark as means of resistance, however, underscores a larger issue endemic to neo-liberal subject formation. Other articles, such as Patricia Clough’s probing work on political economy, biomedia, and bodies, are densely theoretical and continue to pose new methodological approaches. For Clough, one generative insight of the affective turn is that bodies and matter can be informational. This is the founding premise supporting her thesis that techno-capital (as the machine assemblage of new media and global capitalism) has re-territorialized our bio-logics to ever more efficient levels in order that affect can be manipulated, circulated, and mined for value. Both within this piece and throughout the entire anthology, the deft maneuvering between cultural and theoretical studies, between nuanced explication of a body’s being-in-the-world and the methodological alternatives of explication, are the reader’s greatest strengths. Gregg and Seigworth, who’s past work delves into affect from both Deleuzian and cultural studies frameworks, have selected works that can adroitly think scale by bridging micro and macro analysis. However, certain articles miss the mark by going too far in the way of abstraction or close reading. This is not to say that the editors explicitly set out to avoid such approaches, it is only that the Reader’s best works strike a fine balance between a compelling theoretical approach and a focused close reading. Perhaps it is due to the success of such articles that others like Lorne Berlesen and Andrew Murphie’s “An Ethics of Everyday Infinities and Powers: Felix Guattari on Affect and the Refrain,” seem too bogged down by their own theoretical apparatuses. Their article leaves the reader wanting for concrete description and practical application. The fault may reside in the larger issue of appropriating the language of Deleuze and Guattari; while affect theory is certainly indebted to these two, the use of jargon persists as a lingering bugbear to clear communication. Moreover, while Berlesen and Murphy’s article highlights an important aspect of Guattari’s work—the trans-subjective nature of affect within the socius—it often reads like a veritable cut and paste of Guattari’s text and breaks little ground beyond Guattari’s original thesis. Conversely, Lauren Berlant’s “Cruel Optimism” steers to the other extreme. Her thoughtful close readings of the affective levels of texts would have benefitted from a more lucid breakdown of how to adopt ‘cruel optimism’s’ methodology. A more pressing criticism concerning the anthology’s scope is its lack of engagement with media studies. Two brief plot analyses of film and television shows within the anthology hardly account for the place of theatre, film, and game studies in affect theory. Perhaps these fields are considered well-covered territory by now, given such recent works as Steven Shaviro’s 2010 Post Cinematic Affect and Elena del Rio’s 2008 Deleuze and the Cinemas of Performance: Powers of Affection; regardless, a theory reader of this sort ought to broach something of the storied genealogy of affect through cinema and theatre studies, precisely because affect, (beginning with Antonin Artaud’s Theatre of Cruelty), has been so central to its criticism. In any case, The Affect Theory Reader will prove useful to media scholars, less for the discipline-specific methodologies than the concepts variously deployed (by Clough and Gregg, for instance). Indeed, the book’s greatest merit may be that its entrées into both the humanities and social sciences provide practical conceptual tools that prove equally applicable to both fields. Steven D. Brown and Ian Tucker’s “Affect, Somatic Management, and Mental Health Service Users” is an exemplar of humanities and social sciences cross-disciplinarity. Borrowing in turn from Clough and Deleuze and Guattari, they deploy affect theory within a gestalt switch that can examine the bottom-up everyday experience of service users alongside the top-down, determinations of Foucauldian dispositifs. The Affect Reader’s comprehensive and interdisciplinary approach makes it a valuable source for a variety of disciplines, most suitably at the graduate or senior undergraduate level. Notably, the editors state their intention to not have their book serve as an authoritative overview; rather it is intended to be something more “untimely: unfurling in unexpected ways, beyond its presumed moment” (18). This is a perspicacious goal: to introduce a sprawling selection that will seed thought as opposed to foreclosing it, thereby contributing to an ongoing accumulation of knowledge that, like affect, is continually actualizing itself into the world.